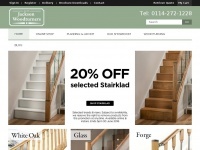 Here on our site we supply you with the best stair parts to really enhance your staircase, with items such as handrails and Balustrades on sale. Get yours today! 1 review has been written for Wonkeedonkeerichardburbidge.co.uk yet. 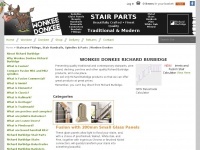 This site sells stair parts for you to renovate or update your staircase with relative ease. 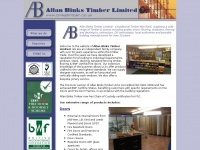 Modern and traditional staircases are catered for using timber, glass and metal components. Balustrading components for outdoor decking is also available, as well as mouldings, architraving & skirting, porches & canopies, and Juliette balconies. Good prices. 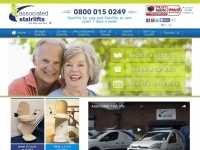 This site is well worth checking out, and the staff are really helpful. Wonkeedonkeerichardburbidge.co.uk presents an article about a specific topic. In total 6 links were found which refer to Wonkeedonkeerichardburbidge.co.uk. Individual words like Burbidge, Richard, Donkee and Wonkee are frequently used in text links from other websites. The most important link sources for this website are Pearstairs.co.uk and Wonkeedonkeetrend.co.uk. The homepage of Wonkeedonkeerichardburbidge.co.uk and the subsite are most referenced by other websites. The table shows the most important links to Wonkeedonkeerichardburbidge.co.uk. The table is sorted in descending order by importance. The table shows websites of Wonkeedonkeerichardburbidge.co.uk, which are often linked by other websites and therefore they are classified as important content. 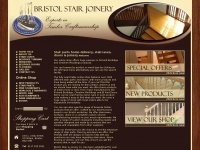 Bristolstairandjoinery.co.uk - Bristol Stair & Joi­nery Co. - Stair­parts, Stair­ca­ses, ..
Jacksonwoodturners.co.uk - Stair Parts - Stair­ca­se Handrails, Spindles & Ne­wel ..
Binkstimber.co.uk - Al­lan Binks Tim­ber Ltd - Tim­ber, Joi­nery, Floo­ring and ..
Associatedstairlifts.co.uk - Stair­lift Manufactu­rers UK | Stair­lift Com­pa­nies | ..